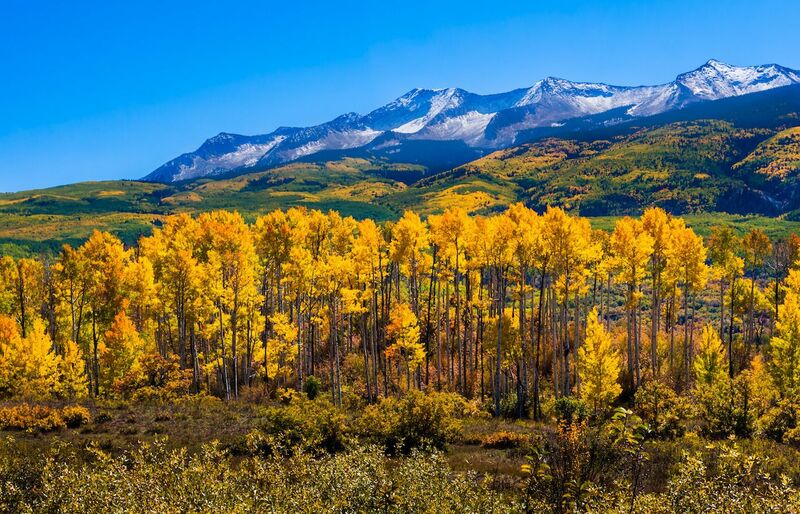 The claim to leaf-peeping fame may belong to New Englanders, but the Rocky Mountains offer their own share of the country’s best spots for fall foliage. The region’s aspens and cottonwoods stand toe-to-toe with any Massachusetts maple when it comes to color. From Bozeman to Boulder, you’re sure to get a good look at nature’s fireworks as the leaves turn in the Rockies. The fact that you’ve got 80-million-year-old mountains for a backdrop, including 53 fourteeners packed into Colorado alone, is just icing on the cake. 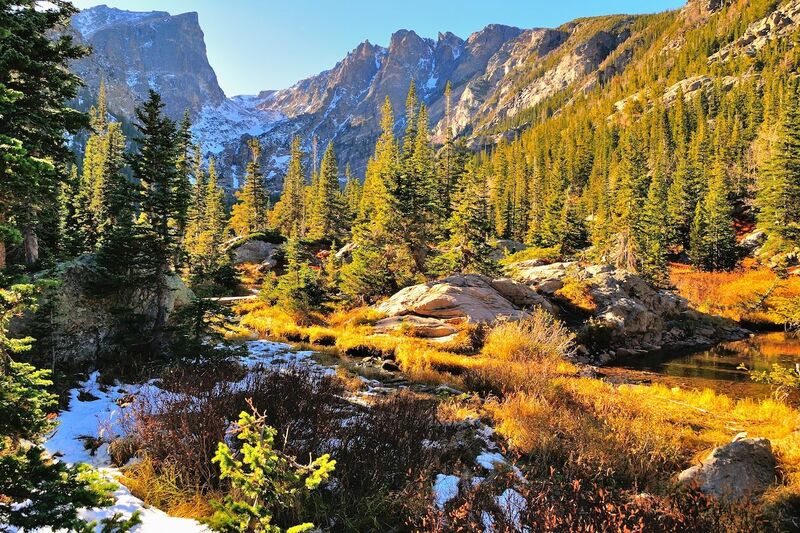 Grab your camera and your walking shoes, and start planning these stunning Rocky Mountain hikes for fall. Tucked within the Pecos Wilderness section of the Carson and Santa Fe National Forests, the West Fork Rio Santa Barbara Trail runs just south of Taos. Enjoy the brilliant aspens lining the trail and running up the mountainsides as you listen to the soothing sounds of the Rio Santa Barbara below. 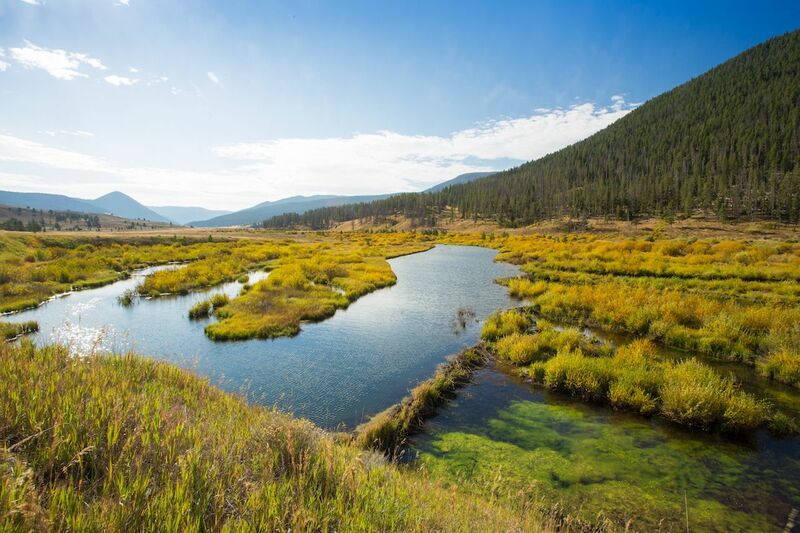 If you go early enough in the fall, you’ll not only catch the turning aspen leaves but also meadows filled with wildflowers. Just be sure to keep your eyes open for wildcats. Evergreen firs, spruces, and pines rise above lower foliage popping with flaming hues on this trail near Brundage Mountain Resort. It’s busy in summer, making fall the perfect time to hike in peace and solitude. After crossing creeks and winding your way on well-marked trails, you’ll arrive at last at the 60-foot Goose Creek Falls. Scramble carefully down to the river for views looking up at the falls. 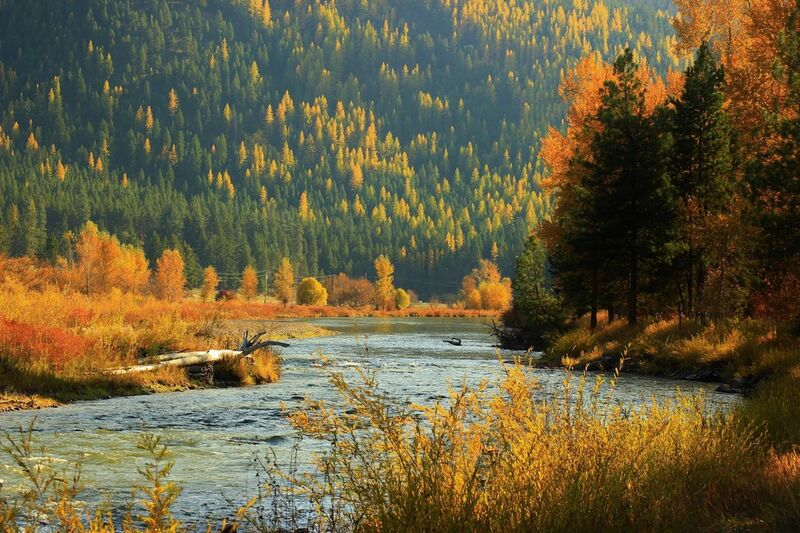 Not to be outdone by aspens in fall, bright orange cottonwoods light up dense forests and expansive meadows on this rad hike through the Northern Rockies. If you hit the trail on a hot fall day, the creek is next to you the entire way in case you need to cool off. While you might not break a sweat with fewer than 500 feet of elevation gain, you can easily make this a longer trek by pushing on to the History Rock or Blackmore trails. These extensions make the area perfect for quick day hikes or overnight trips. This hike is popular with visitors and locals alike as the mountain’s peak provides views of Missoula and the University of Montana below. In fall, the valley bursts with a range of oranges and yellows as the leaves turn. 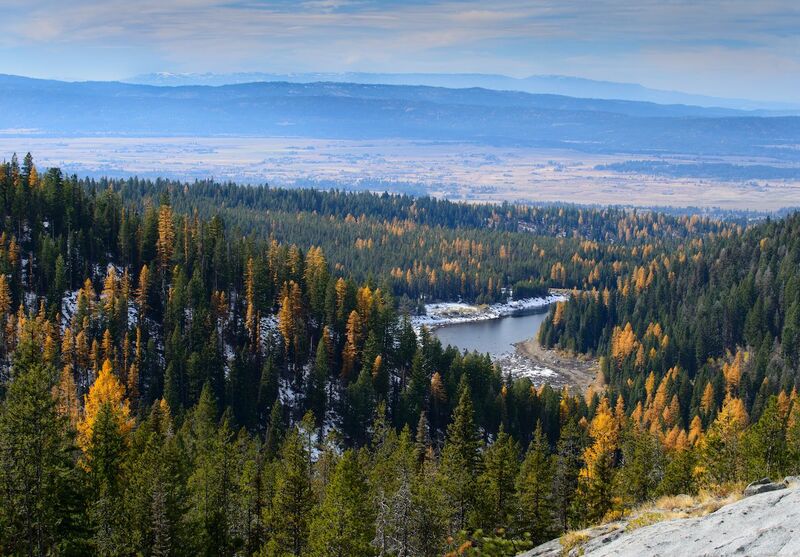 You can also see the Clark Fork River and mountains to the north and south from the summit. Make sure to snap a shot of the famous concrete “M” poured atop the site of the original stone symbol that students built at the turn of the 20th century. This loop hike offers a huge payoff for seemingly little work. Glacial lakes reflect craggy Teton peaks, including Grand Teton itself. The peak towers nearly 14,000 feet over sagebrush and patches of forest aflame with autumn aspens. 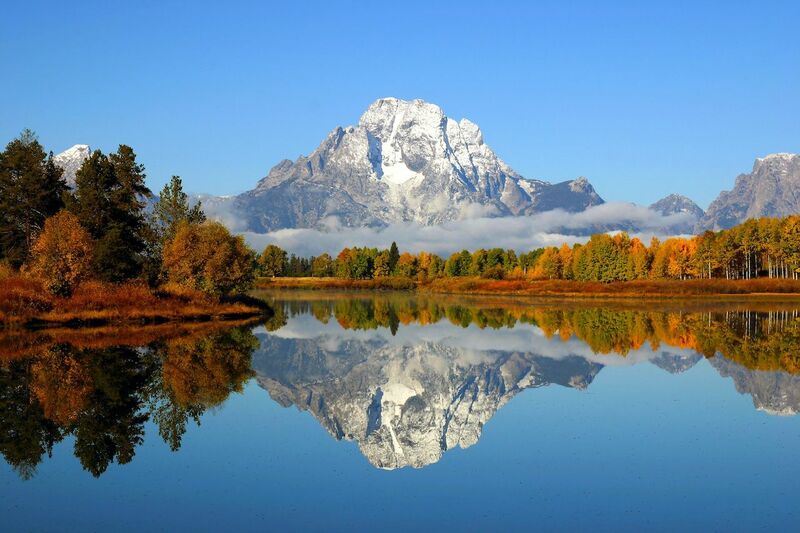 Bust out your camera for the panoramic views of the Tetons over both Bradley and Taggart Lakes. Plus, the woods are packed with wildlife — just don’t forget your bear spray. The Fern Lake Trail offers beautiful views of the valley below as it winds along the Big Thompson River before dropping into Fern Crash at The Pool. Here, a forest fire blazed through much of the surrounding area in 2012. 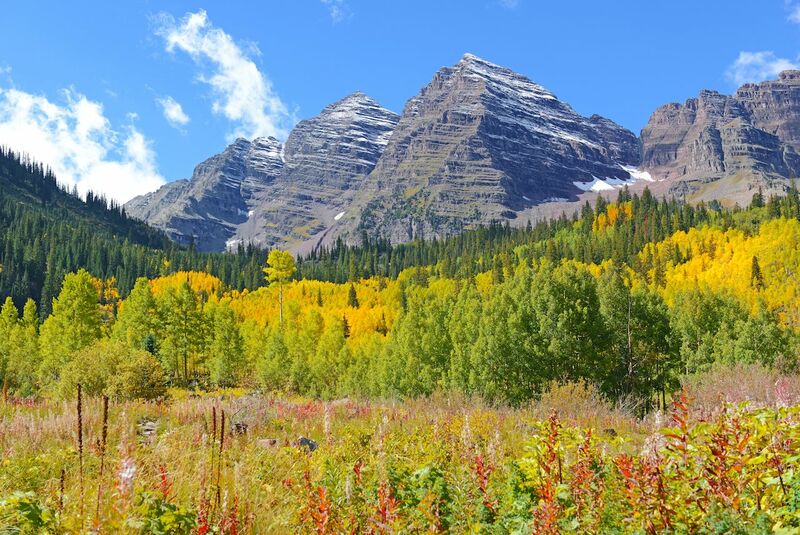 You might think pockets of it are still burning, but those are just the aspen trees changing color, famous for painting swaths of the mountainside a stark orange during fall. Further on past The Pool you’ll see magnificent 60-foot-high Fern Falls before continuing the climb to look at last over Fern Lake. From the lake’s northern shore, you’ll have stellar views of 12,000-footers Notchtop and Knobtop Mountain. Hike a short distance to the eastern side for killer views of Stones Peak, watching over the lake at nearly 13,000 feet. Cooler autumn days should give you more privacy on this heavily trafficked trail to the red rock arch. It may be short, but it’s no cakewalk. 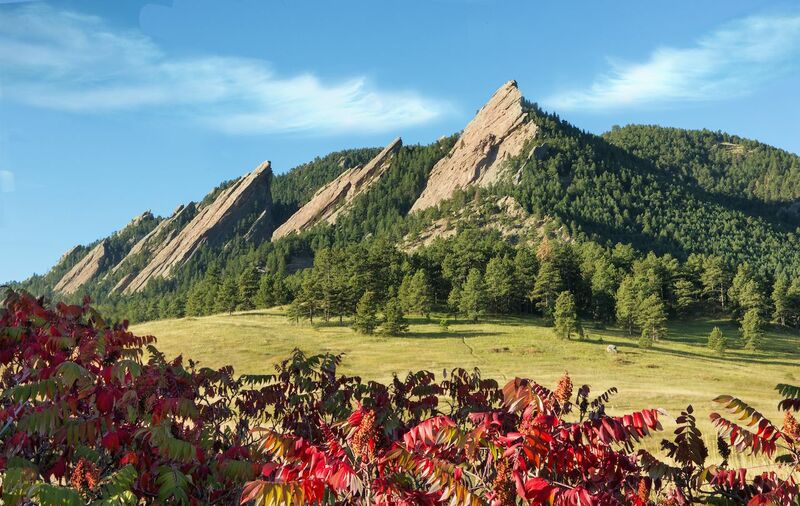 You’ll gain 1,400 feet of elevation through a grassy meadow and pine forest as you hike upwards along the base of the Flatirons. When you’ve hit the flagstone staircase, scramble up and claim your reward: spectacular views of the golden leaves exploding across the Boulder Valley. As legend has it, the Maroon Bells are the most photographed peaks in Colorado — likely a result of the parking lot at Maroon Lake, which gives tourists a hike-free payoff. You’ll become a master of the switchback on the way up and be rewarded for your efforts with much better views of the peaks, Castle Creek Valley, and the surrounding Maroon Bells Wilderness as you work your way up towards American Lake. Take photos as you rest on the way up, or completely unplug and just take in the epic scenery.